If so, I am a bit jealous, because you are about be charmed by one of the most beautiful countries on Earth! Croatia has countless spots to visit! 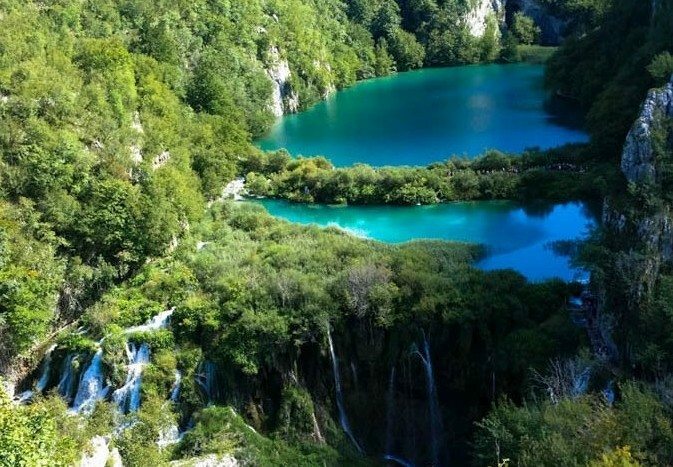 In this post, let’s talk about the famous Plitvice Lakes National Park in Croatia. If you need help planning your Croatian vacation, you can read about it here. 1. What are those lakes and why should I even bother going to Plitvice park, Croatia? 3. How much is the entrance? 5. How do I get around in the national park? 6. 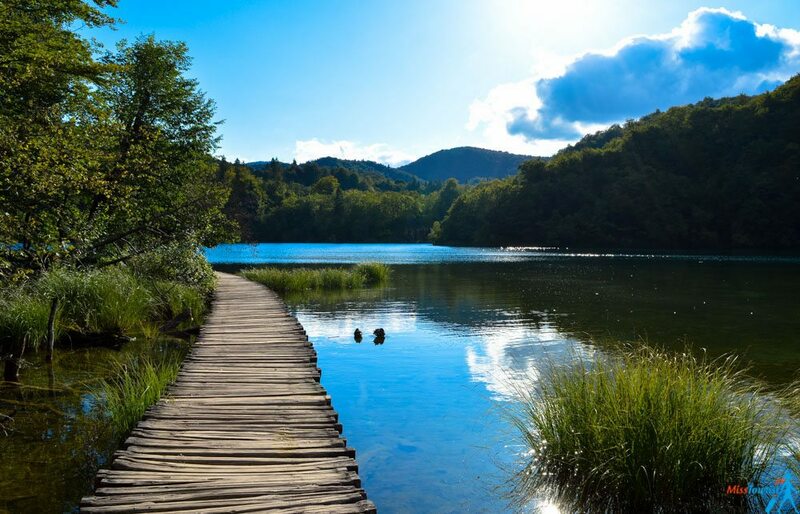 How to get to Plitvice Lakes National Park? 7. When is the best time to visit Plitvice lakes? 8. Can you swim in Plitvice Lakes? Where to stay in Plitvice Lakes National Park? 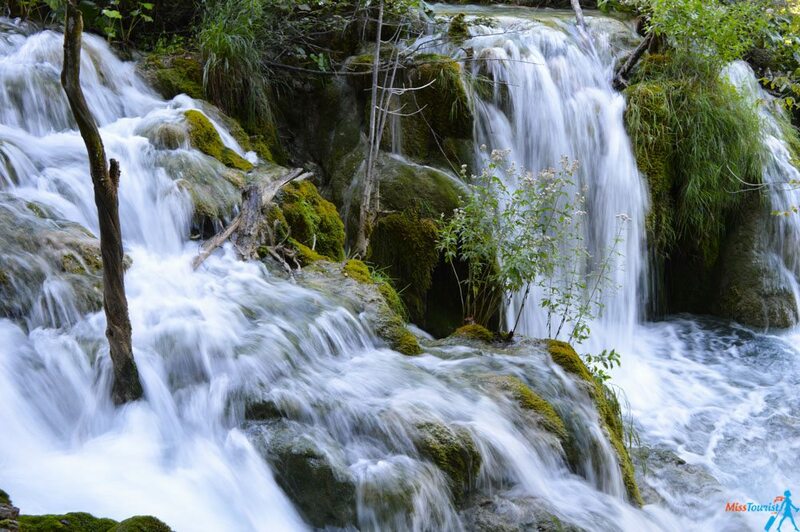 Have you heard about the amazing Croatia waterfalls? 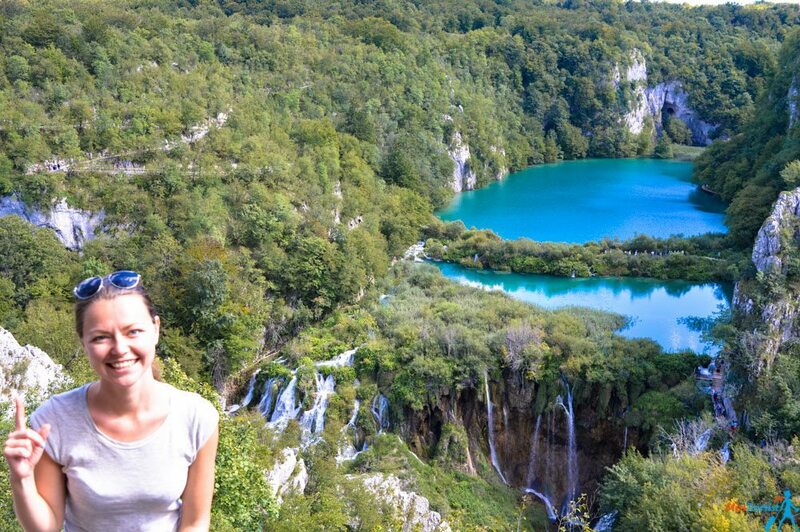 If so, Plitvice Lakes National Park should be on your Croatian bucket list for sure! Plitvice lakes (Plitvička Jezera) was the number 1 place I wanted to visit in Croatia! That is why after just 1 day in Zagreb, I left the hustle and bustle of the city and headed to this amazing natural ensemble of Plitvice waterfalls. And I did not regret my decision. Why? Hopefully, you will understand soon just by looking at the pictures below. Plitvice is an ensemble of 16 natural lakes. It is a UNESCO heritage site due to its breathtaking views, its fauna and the unique turquoise waters. 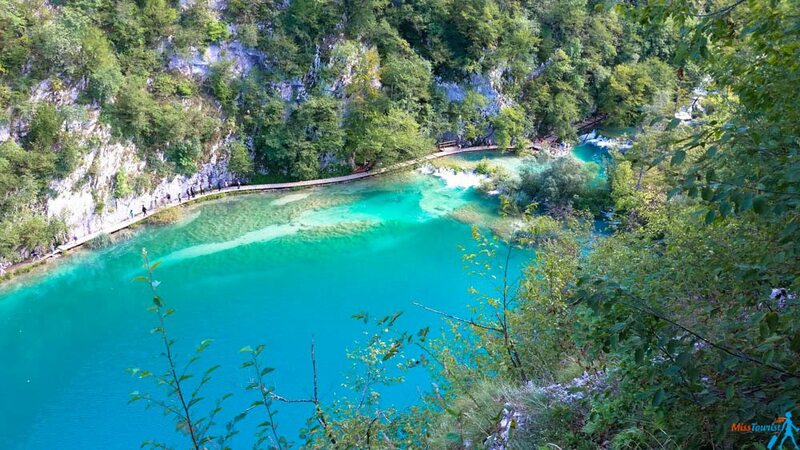 Plitvička Jezera National Park is located in the middle of the country and is about 130 km from the capital, Zagreb. It is great, as it makes it easy to visit in a day trip from Zagreb and from Split. It depends on what you are looking for and how tight your schedule is. For instance, if you want to simply check the place off from your to-do list, or, if you are on a tight schedule, it is totally doable in 1 day. As I mentioned above, there are plenty of day trips offered from Zagreb or Split, so that would not be a problem. But if you ask me, 1 day would be a bit rushed in my opinion, you will not be able to enjoy it to the fullest. I stayed overnight in the park, and 2 days seemed just perfect for me! On the other hand, if you want to do some extra activities (read below) and have a relaxed schedule, why not to stay there for 3 days? You will not get bored, I promise! PRO TIP: Try to start your park visit in the early morning – you will take amazing pictures and will walk the park without the crowd. It is completely different atmosphere without tourists! 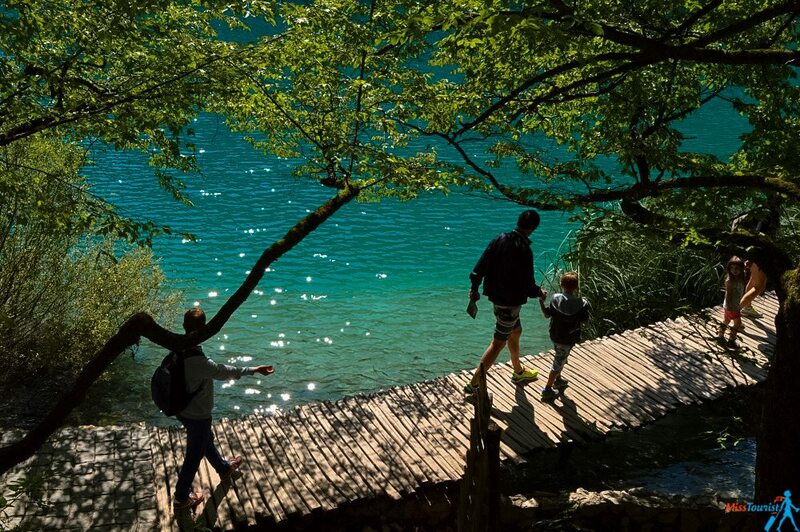 NOTE: Wondering about the Plitvice lakes opening hours? The park is open 365 days a year and the entrance times are between 7 am and 8 pm. I often get asked what is the Plitvice Lakes National Park entrance fee. They have different packages depending on how many days you want to stay, the season and your age. The most expensive ticket for an adult during the high season for 1 day is 250 HRK (~34 EUR). In order to save on your Plitvice lakes tickets, you can go after August (off season), or get a 2-days ticket. Don’t forget to take your student ID if you are a student (your entrance is 160 HRK or 22 EUR in this case). Note that all the transportation INSIDE the park is included in your ticket. There are ferries and a small train that will take you from one side of the park to the other. The food is not included, however, there are plenty of restaurants on station points, where you can get a snack or a full meal. PRO TIP: to save your time in queuing – there are two entrances. Plitivce Lakes Entrance 1 can get a bit crowded during touristic season. Just head your way to Plitvice Entrance 2, it is close, and there are way less people there. If you have already surfed the Internet and saw pictures of the lakes, you probably have seen the picture above, right? But the problem with this view is that is not really obvious how to get there, there are no arrows saying “This way to the amazing post-card like view”. So, where the hell is this view and how to get there? No worries, I investigated everything for you! 😉 I was unsuccessfully searching for it and eventually, I just pointed on the ticket (there was a photo of that view too) and asked the staff how to get there. You can do that too, but let give you a small instruction just to make it easier. Make sure to go there, this is the best view to the lakes! If you take Plitvice Lakes Entrance 2, once you are downstairs at the river, take the boat to the other side (2 minutes). 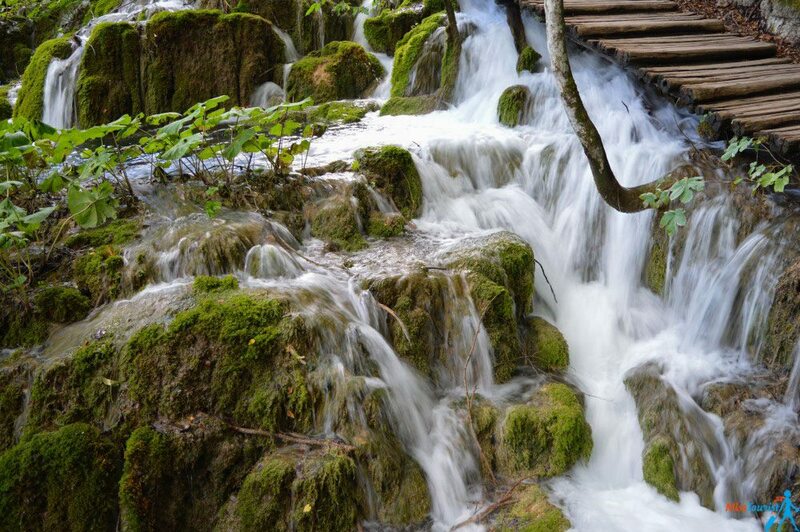 The territory of Plitvice lakes is huge and you definitely cannot go around the whole park by walking. That is why there is a special transfer service that will take you from point A to point B either by ferry or by train. 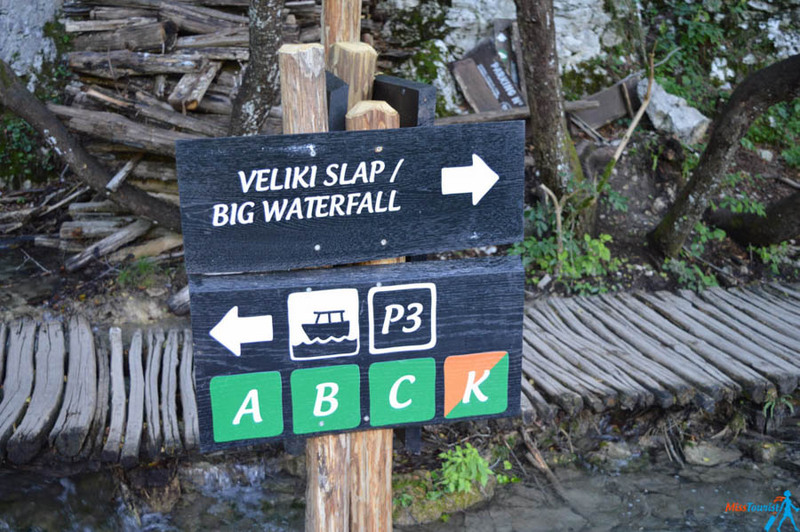 As you can see in the Plitvice map above, there are certain routes for getting to the different points in the park. The transport runs according to the schedule, the frequency depends on how busy the park is. I waited in line for a maximum of 20 minutes, so do not worry about standing in lines for ages! (Yes, avoiding lines are very important for me, I wrote a great post about how to avoid lines in Paris). By the way, if you want to visit the park with your dog, it is not a problem, I have seen many people walking in the park with their dogs. 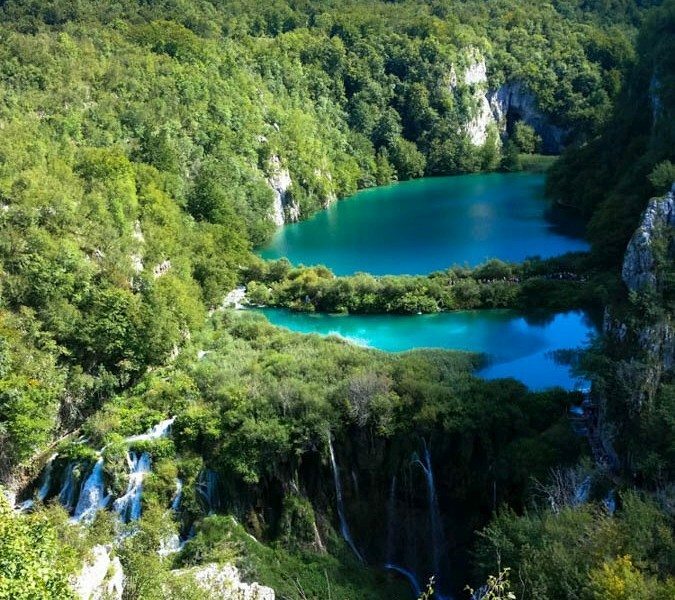 Zagreb Airport is the closest airport to Plitvice Lakes. These are good news as, being the capital, it is very easy to get to Zagreb from abroad. It is 130 km (or about 2 hours driving) from Zagreb to Plitvice. The best option to go around the whole Croatia is definitely to rent a car. The roads are great and you get to see some truly breathtaking coastal views! In the case of Plitvice lakes, it is also easy, many people arrive with the car, the parking lots are available everywhere! Check the rates and today’s discounts for a car hire here. 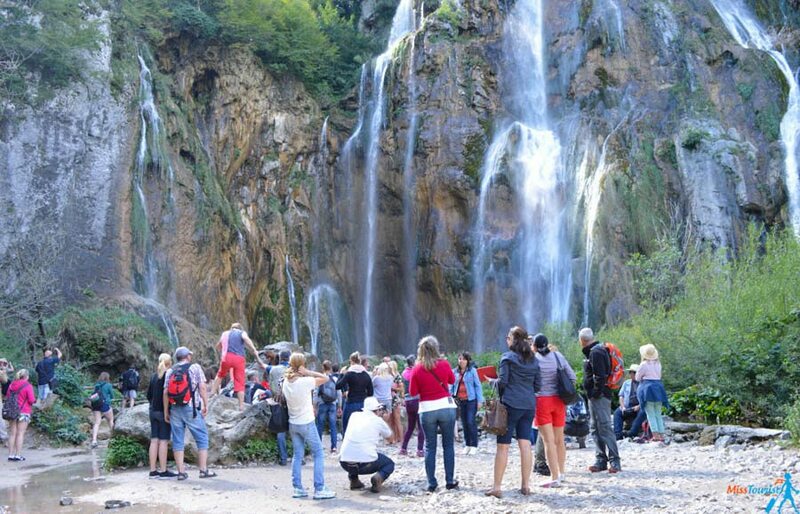 NEW: Private Night walking tour in Plitvice lakes! I think this would be pretty awesome and mysterious to see the lakes under the moon and stars! Are you in Croatia, searching for a bus from Zagreb to Plitvice Lakes, for example? You should know that there are many buses departing from all the major Croatian cities that are quite cheap and they run very often. You can see the schedule and buy tickets online here. There is even a bus that departs directly from Zagreb Airport in case you do not want to stay in the city! NOTE1: Keep in mind that you will have to pay a small luggage fee similar to the one you pay to low-cost airlines (from 7 to 10 kunas, ~1 Eur). You can usually save about 5% by booking your ticket online for bus companies like Arriva. They also have Wi-FI on board by the way! When you can, seriously, as Plitvice weather is mostly nice and welcoming. I have been there in early October, the weather was still nice and the water was incredibly turquoise. But every season is different in its beauty. Think of visiting Plitvice in the winter? I bet it looks gorgeous covered in snow as well! 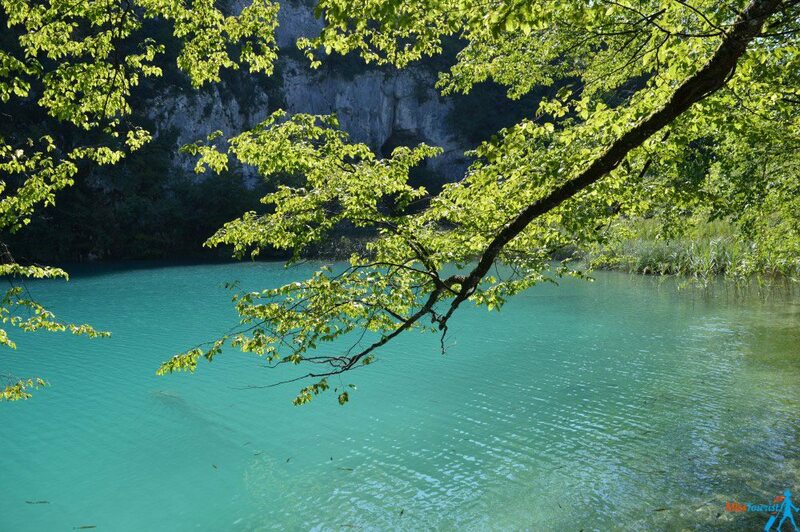 Are you in the mood for some Plitvice lakes swimming? Unfortunately for you, swimming in forbidden in the park ever since 2006. But I got some good news, too! In case you really want to swim in some wonderful, turquoise water, you can do so in Krka waterfall National Park in Dalmatia. This park is only 2 hours away from Plitvice and you can bathe there for how long you please, although you can’t actually swim under the waterfalls. So, Krka or Plitvice? My answer is: both, if you have the time! There are more and more accommodations around the national park, home-stays are popping up like mushrooms after the rain! 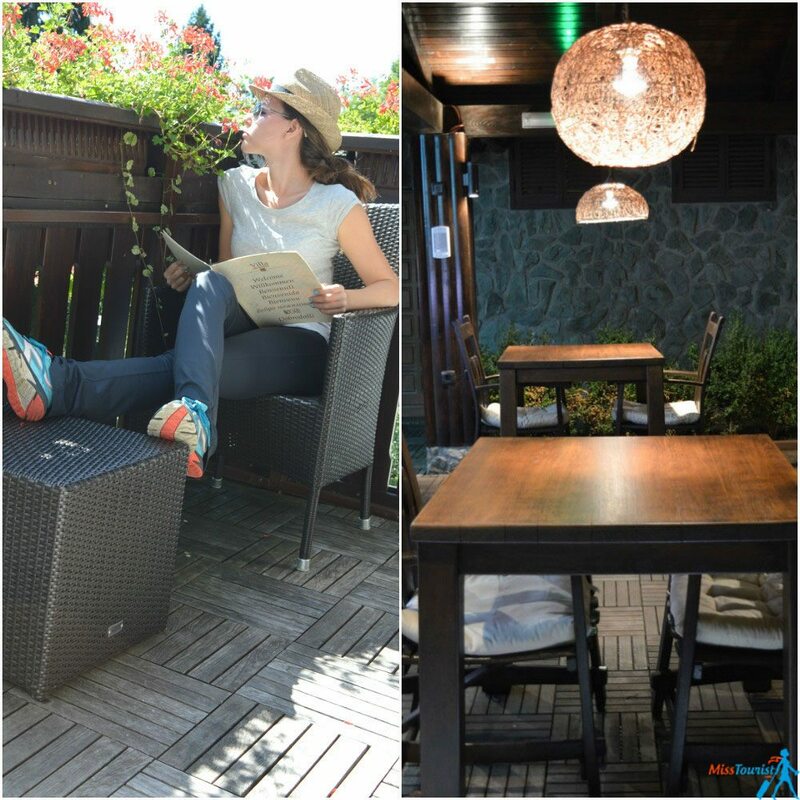 I stayed in Villa Mukinja, which I can definitely recommend, it is one of the best places to stay in and the perfect Plitvice accommodation! This family run hotel is open for more than 30 years. It was there even before the tourist boom and it has a great value for money! My room was spacious and clean, all amenities needed were provided. The dinner is an extra option, but you will miss so much if you opt out, local food is a part of the Plitvice experience! You will get an AMAZING dinner that you will remember for a long time! What I had for my dinner was an appetizer (could have been easily a dinner by itself), a salad, a soup, one of the 3 local specialties of your choice (fresh catch of the day, meat dish or a vegetarian plate) and a dessert. Crazy! Everything I wanted to do afterwards is to melt in Jacuzzi and relax in the sauna, which is free of charge for all Villa Mukinja guests. The breakfast was the same huge, I don’t think I have ever had a bigger breakfast anywhere else! Just to give you an example – me alone, I had 5 pitchers of different types of drinks – a pitcher of milk, tea, coffee, water and juice. Did they seriously think I could drink it all by myself? The owner told me that if their guests stay for 2 days or longer they get used to the amount of food offered, but at first it comes as a shock. Oh, and by the way, the place is located 10-15 minutes walking from the park. It is an enjoyable walk through the forest. I loved the location! If you arrive by bus, just give them a call or tell them in advance what time you arrive, and they will pick you up from the bus station. Book your stay with Villa Mukinja here! NOTE: There are 3 hotels located in the National Park: Hotel Jezero, Hotel Bellevue and Hotel Plitvice. Out of all three of them, Hotel Jezero is the only one that stays open all year round. Bellevue and Plitvice Hotel are closed in December, January, and February. More about them below. Luxury hotels: (100$ and up) – Hotel Jezero is a great hotel in Plitvice that is actually located inside the park, which is a great advantage! 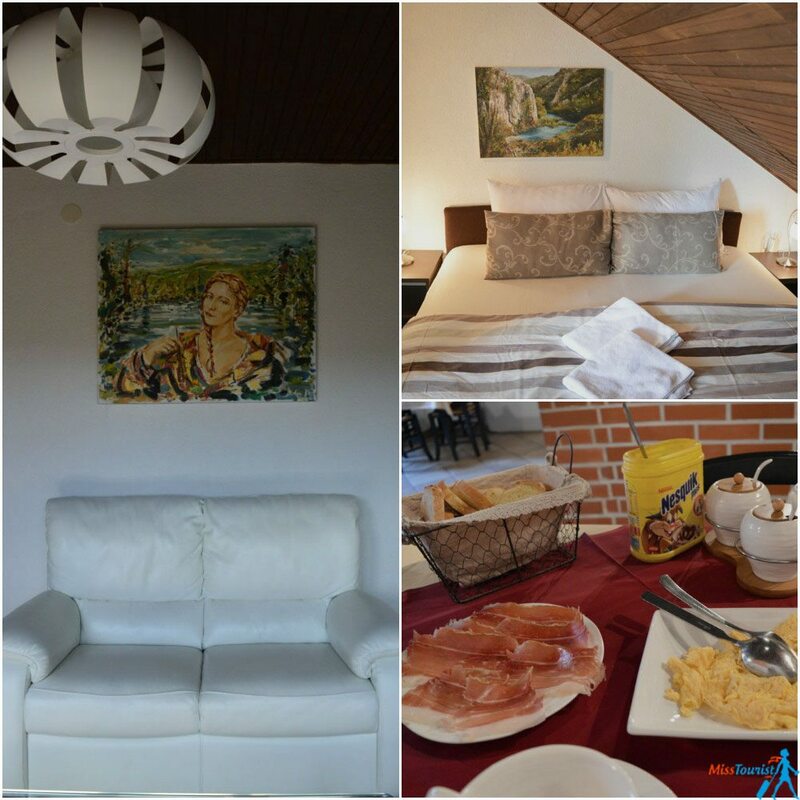 Villa Lika has better room decor in my taste and the reviews are outstanding! Medium price: (50$ – 100$) – Another great hotel located right inside the park is Hotel Bellevue – the rooms are very cozy and clean and the entire accommodation offers a peaceful experience! Hotel Plitvice is another awesome choice, located right next to the entrance to the National Park and close to Hotel Jezero! Pansion Breza is a perfect choice and one of the best Plitvice lakes hotels, although it is located 1 km away from the park! It only has 7 rooms, so hurry up if you want to book it! Guest House Nenad – also located minutes away from the park entrance, it offers a quiet setting and clean rooms! Budget accommodation: (up to $US 50) – The closer you get to the park, the pricier it is. Thus, if you want to stay on the budget, you will have to walk 4-5 km, or have a car. House Dado is great if you are searching for something close – private bathroom, nice surroundings, book in advance to get that price! If you are driving, Guest House Bruna and Guest House Kolić would be great choices for you – nice prices and amazing reviews! In case you don’t want to a hotel near the National Park, you should know that there is also the option of Plitvice camping! There are six campsites near the park and all of them are different in terms of comfort and interests. Here you can find a list with the recommended campsites and details for each of them that I hope will help you make the most out of your Plitvice lakes camping! While, after Iceland, I got spoiled and it is hard to amaze me with waterfalls, Plitvice lakes still amazed me with its beauty. Its turquoise waters are a totally different experience! 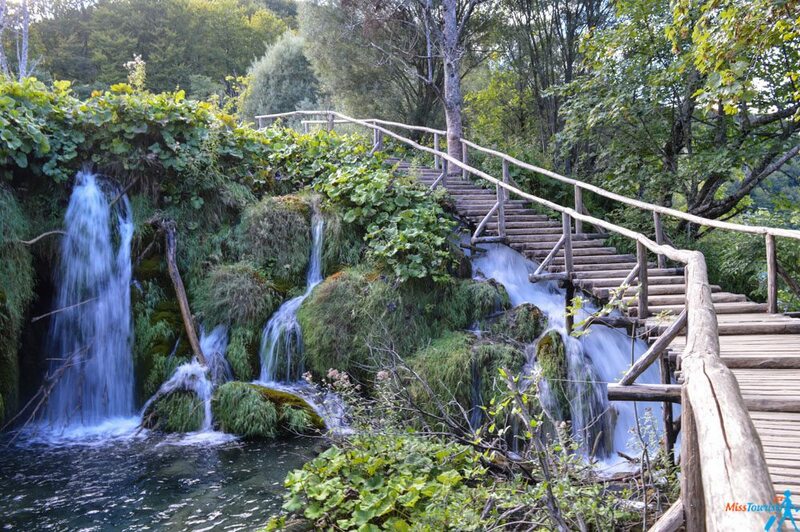 I really want you to visit this Croatia waterfall park if you are in the country! It would be such a pity, if you would just pass by it! P.S. Even though Plitvice is one of the best natural parks in Croatia, the nature of this country is breathtakingly beautiful, I wrote about my experience in Split here. If you are heading to the Istrian coast, start from this post, it is my favorite region in Croatia, breathtaking! Disclaimer – I was invited to Villa Mukinja as their guest, all opinions are my own! Have you been to Croatia? 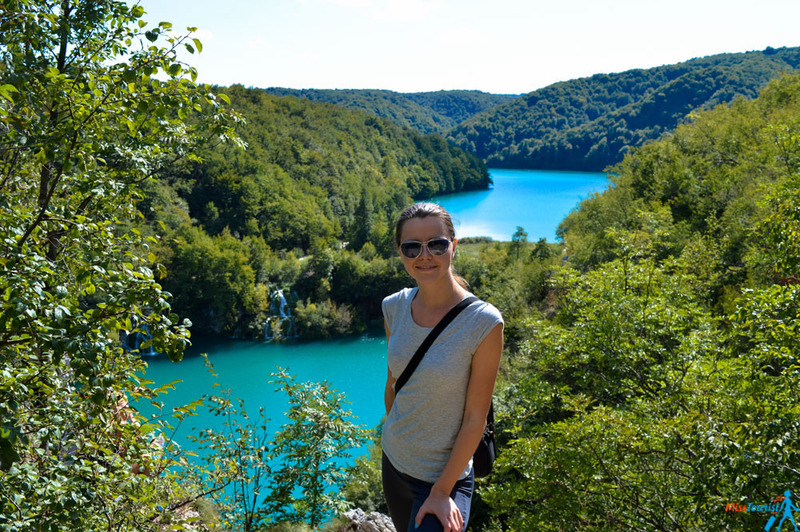 What do you think about adding Plitvice Lakes to your Croatia itinerary? Feel free to ask me questions in the comments below, I love talking to my readers! We have often thought of going back to Croatia to visit these lakes. Your gorgeous photos have convinced me that we must! We are thinking of visiting Croatia, but we have lots of kids, so that would be a totally different experience. Thanks for the review, Юля. Is it possible to take a bath in the lakes? Heading there in September 2017, can’t wait!! come as early as possible and it will be fine! Going in August – so looking forward to it. This place looks so spiritual – paradise on earth…….. Thank you so much for the directions to the most amazing view in the park! My boyfriend and I were the only ones there for about 30mins and it made up for the extortionate entry costs and lack of a free map! Thanks again! how about visiting in december? Should be different, but beautiful nevertheless! Thank you so much for this post! My family and I just visited Plitvice Lakes one week ago. We followed your directions to the secret lookout spot over Veliki Slap and loved the view there! So good I’ve found your blog. Thank you for being able to find Veliki Slap. I’m sure we’ve never knew and found it without you. Beautiful lookout. We climed up at the big waterfall and really there was no sigh at all to show this sightseeing pont. We tried to persuade people not to miss it. Would love to visit Plitvice lakes but what’s the nearest coastal area to stay in please? Will be visiting the lake on 25th october. Your post is very useful. Thank you so much. How was the weather in October last year? We will be there at the same time this year!! Great blog, yulia….and beautiful pictures. many thanks you recommend to spend at least 2 days in the park, and i agree that i want to do it at leisure. So… how would you recommend to split the visit between the 2 days in the park – lower lakes in the afternoon of arrival, and upper lakes the next morning? or??? also – from a photography point of view – when is it best to visit the “secret” lookout – in the morning sun, or the afternoon? I’ve read some reviews stating that it is extremely crowded to visit during the month of June. I plan to go there end of June, do u think it is worth it ? And also how do u suggest getting to Plitvice from Split. 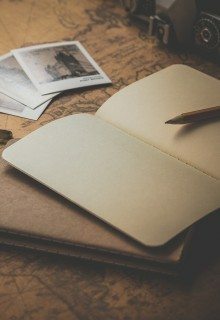 Fantastic blog and v helpful for us. Good work! Can you advice if my elderly mother (age 83) would be able to walk on the paths and if there a wheelchair service avaialble at the park? Also would you recommend 2 days to see the park and any nice house to stay nearby for 6 people in last week of July 2018? I am sorry, I can’t really advice on this. I think there must be some path accessible with a wheel chair, but I remember some path having small bridges and steps, which would be inconvenient for your mother. I recommend calling the park directly and asking them about this, hopefully they will be able to help! As for the hotel, i stayed in Villa Mukinja and I loved it, such a great hospitable place with Huuuuge breakfasts. It is about 10 minutes walk from the park if I remember correct. If you would like a hotel right inside the park, Hotel Jezero is a great choice! have a wonderful vacation and I hope your mother will be able to see those beautiful spots! We are heading to Plitvice over Easter and this has been amazingly helpful – thanks! Can’t wait to see it in person! Hi! Do you have any recommendation for combining these lakes with other cities/places in croatia? 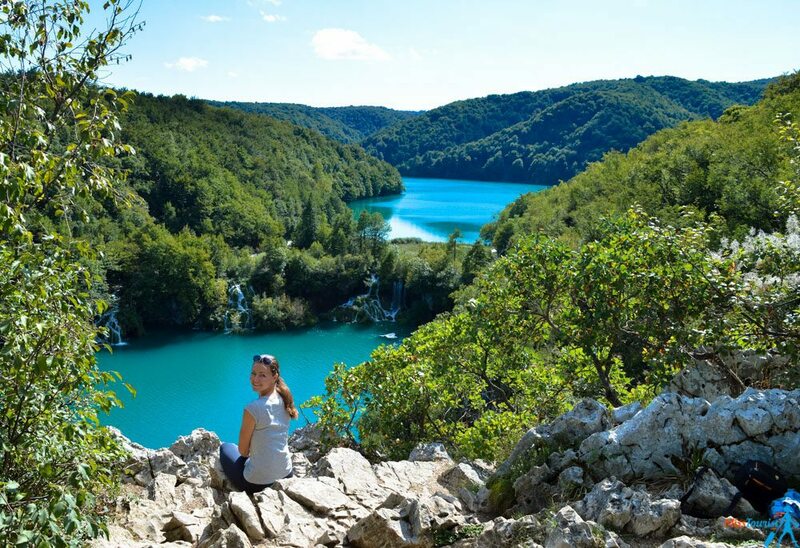 We are planning a holiday to Croatia for about a week-10 days and we definitely want to visit Plitvice lakes, but we don’t know what other places not too far away (but we will have a car so a few hours drive is no problem) are a must see! Yes, please check my other posts on Croatia. I would definitely recommend Split and Istria region, both are so beautiful! Hi! thanks for your blog. If we started at Entrance 2 and had 4-5 hours, which way do we go? The map is quite confusing which is the upper and which is lower lakes. Which way do you recommend? What are the trail numbers? If you take entrance 2 , once you are downstairs at the river, take the boat to the other side(2 minutes) by boat. Oh no!! I hope they will fix it as soon as possible. Thanks so much for your update!! Is it still possible to get there WITHOUT a car? I’m going to Croatia/ Montenegro this month and wanted to ask if it’s cheaper/ easier to buy tickets online for buses (including to Plitvice) or in person at bus stops? Let me know and thanks for posting! talking about Croatia, it is fine to buy tickets at the cash register as there are no lines usually and i did not encountered any miscommunication problems. As for money saving, I believe Autotrans provides 10% discount if you book tickets online, so it might be a better option in this sense. Hi Yulia, thanks for your blog. We are thinking on travelling to Croatia this summer and I found your words snooping around. We make our trips by van, could You tell me about our possibilities to enjoy that beautiful place by driving? Even if I havent rented a car during my trip in Croatia, I have heard so many things about how beautiful it is to drive those coastal roads! The next time I come back, I will definitely do it! If you haven’t booked your car yet, check out this site, they are basically a skyscanner for car rentals (including the local companies). Hi! This is so helpful! Are there places at the entrances to leave bags? I’m going early next month and plan to go from Zagreb to the lakes to Zadar in the evening. Thank you! Hi, after reading your blog I checked the park’s website; however I’m a little bit confused. The Lake tours programs (A, B, C programs and so on) are guided or you can do it by your own? Also what do you think is a must see? I’m wondering if soemeone can show me with a map how to now get to the secret spot? I’m looking at the map but am quite confsued. We will be there next month (June, 2018). Thanks. You wrote a really nice post with a ton of info and great pictures! Great detailed information! We are planning on going in September but we have a 3 year old in tow. How long would you say it took you from Entrance 2 to get to the viewpoint? Anyone got an update about the secret spot? Is it still close by the stairs?? 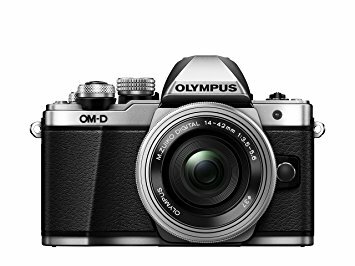 I’m going in 2 weeks and I would like to know! Thanks! I just visited the park last week. The stairs are still closed. I was able to access the spot by driving to it just as others mentioned above. How did you get there by car: I mean, what did you enter in your GPS as the endpoint? I just typed in Veliki Slap as I was leaving the car park. It took me up the mountain and there was an area right before a small bridge where i parked my car. There was a foot path next to the bridge and I followed that to get one view of the lakes from above. Then I went back up the path and over the bridge and found another path. This path led me to Veliki Slap and the stairs that aren’t accessible from below Veliki Slap. Hi Jen. I will be there soon and i don’t want to miss this secret spot. 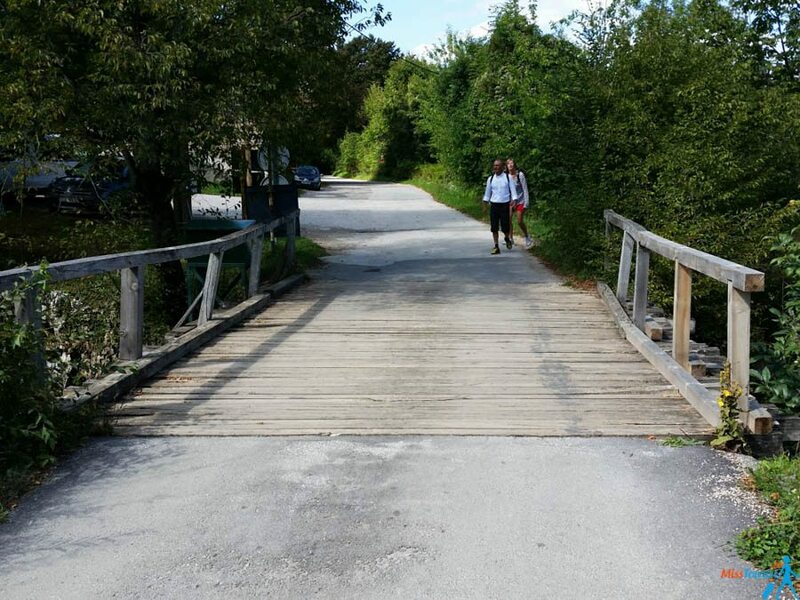 How far (meters) does the correct foot path from the small bridge? After coming up the mountain by car, I parked right before the bridge. There was foot path immediately to my left right before the small bridge- a few steps away. I followed that just for a few minutes before I found the viewing point. Then I walked back and over over the small bridge, and there is a other foot path on the left. Neither of the paths looked as if they were kept up by the park, just more that so many people have walked this area and created the path. Hi. Do you know if the eating places in the park cater for gluten free? Hello! 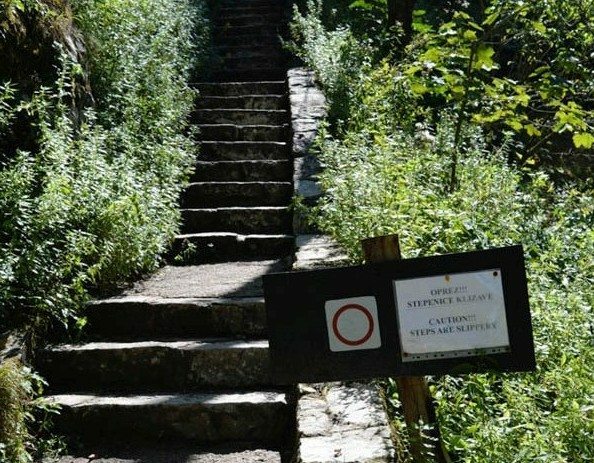 I was in Plitvice NP august 8th 2018 and the path to the secret spot was till closed with 2 differents big warnings signs and it seem that it will be closed for a long time for construction. I didnt reach the spot by the road because I didnt have a car but had a wonderful time in the park. Thank you for your enthusiastic review of Plitvice. I greatly enjoyed reading it and made me more excited in visiting the place. We are scheduled to visit Plitvice in mid October. Hi Yulia. There are two other hotels inside the park right next to Hotel Jezera. They are the Bellevue and the Plitvice Hotels. Jezera is the only one that stays open all year. The other two close in December, January and February. It is 31 October today and I am staying at Plitvice Hotel. Thanks Tina, we have updated the post thanks to your comment! I am a trained limnologist; scientist who studies lakes and streams. I am 74 years old and I am deciding whether to visit the lakes. Since I walk with the hep of a cane, would it be possible to get around enough to make this side trip valuable? To me it looks like there is a lot of up and down walking to get to the best viewing sites. you will love it there in Plitvice, i am sure! It really depends on you, there are indeed quite many little bridges that you would need to climb up and then down, but if you are ok walking with a cane, I think you would be able to do it! I had a food poisoning on the day that we were going to the park( we stayed outside but within 15 minutes drive), and was not able to go with my family. They started at 7:30 am and returned around 2 :30 pm. Feeling woozy, I still decided to go inside and spend only 30 minutes there after 4 pm, walking a short distance from the entrance #1. And still, it was unbelievably beautiful and completely different from many other sites and lakes that I have seen( including lakes in Canadian Rockies, in the Great Caucasian Mountains, Caspian, lake Tahoe etc. ).Even, if you are not able to go to all the little lakes that they say are the most clear and colorful, you might enjoy it. I’ll be traveling at the end of month to Plitvice but only for the day. I saw there’s a bus to Split at 23 40, can I stay somewhere until that time? Maybe you can stay in a restaurant and enjoy dinner until the bus departs? Bistro & Caffe Plum (closes at 11 PM) or House Katarina might be two good choices for you!